Laminated flooring is made up of a high-density fibreboard (HDF) core; a melamine-impregnated decor layer which is a photographic reproduction of a real wood or tile floor; and a highly-resistant synthetic resin-treated cellulose protective overlay on top to give the floor the protection and durability required. Under the HDF core is a balancing laminate which improves the structural stability of the board and prevents moisture from getting into the HDF core once the floor has been laid. Under immense pressure and heat this 'sandwich' is bonded together to form a huge sheet of flooring which is then cut into smaller boards, the edges of which are then profiled so that the boards can be locked together without the need for any adhesive. During the production process surface finishes such as embossing and texturing are applied. The Faus Loc locking system simply locks together for easy installation. 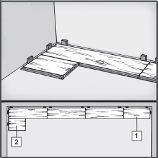 Have a look at the installation tab to see a video of just how easy it is to put a floor together. The high-density fibreboard (HDF) core is a wood product formed by breaking down low grade timber and forest thinnings into wood fibres, combining them with wax and resin, and then forming panels under high temperature and pressure. The result is an incredibly strong and stable product suitable for a very wide variety of uses. The density of HDF varies between 800 - 1450 kg/m³, the choice of density being the factor in a floor that determines the toughness of the floor for the grade of flooring required. 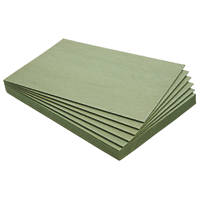 Put simply, the higher the density, the greater the impact resistance and the heavier the use the floor can cope with. 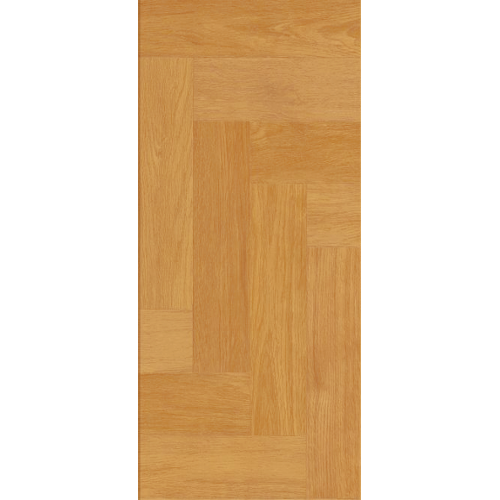 Faus floors are environmentally-friendly as standard and are made from wood sourced from sustainably managed forests. The entire production chain from raw materials through to the finished product has been certified and is regularly inspected by independent experts. The surface of a Faus floor is protected from moisture by the melamine resin impregnation of the decor paper and the overlay. That doesn't make a floor suitable for use in bathrooms or wet areas but it does stop moisture from penetrating the top surface of the floor and causing the HDF core to swell and subsequently deteriorate. The surface of a Faus floor is therefore non-porous and resistant to spills. Even red wine, oil and jam won't affect it, so don't panic - they're easily removed. Don't however use floor polish as it can't be absorbed by the floor and you'll end up with a skating rink. The floor is also resistant to abrasion and tough. 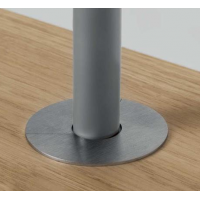 Heavy furniture won't leave an imprint although ideally castors and furniture legs should be protected with felt pads. Naturally it’s important that your floor stays as clean and free from bacteria as possible. Whilst bacteria can't be seen, the kinds of harm it can cause if it's not eliminated are well known, for instance heightened allergies and disease. 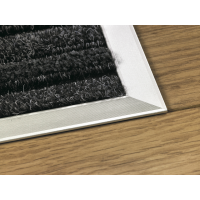 For this reason Faus floors incorporate anti-allergic and antibacterial properties as standard. 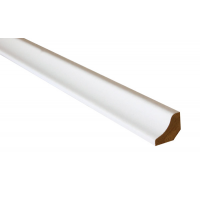 Jointguard is a patented Faus technology which protects the edges of the boards against friction and heavy footfall. 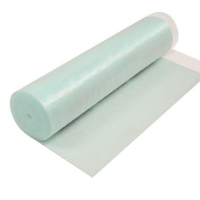 All Faus interlocking joint surfaces are specially impregnated with a paraffin solution which repels moisture and gives the floor added protection should any moisture get into the joints. All our Faus floors have a subtle micro-bevelled edge around each element on a board, which highlights the design of each floor and presents a completely natural look. The surface of each floor also reproduces the natural feel of the material, be it the natural grain of the wood, the roughness of the stone or the softness of the ceramic. All Faus floors are designated Class 23 for residential use which means that they are suitable for heavy domestic use in all rooms except bathrooms and wet areas, so bedrooms, guest rooms, living rooms, dining rooms, kitchens, corridors, home offices are no problem. All Faus floors are also designated Class 33 for commercial use which means that they are suitable for heavy loads and traffic in areas such as large offices, shops, public buildings etc. All Faus tile floors have an abrasion resistance rating of AC6, guaranteeing that the appearance of the product does not change over time. 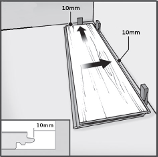 Your Faus floor is really simple to install! 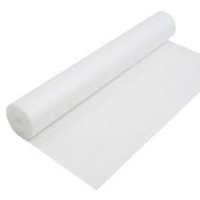 The Basix Standard White underlay is a 3mm white polyethylene foam underlay with excellent sound insulation properties. 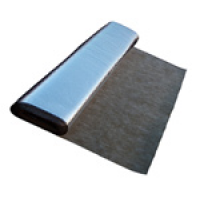 It absorbs minor floor imperfections and is suitable for underfloor heating. It's lightweight and simple to install. 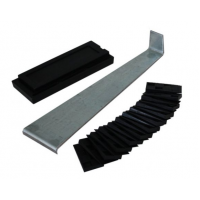 Bear in mind that to comply with the manufacturer's warranty you will need to use a separate damp-proof membrane wherever the sub-floor is concrete. 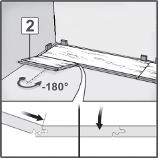 The Faus Loc interlocking joint used in our Faus floors is really simple to use. 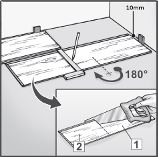 Have a look at the video and see how easy it is to put a floor together. You should lay the tongue side of the floor up against the back wall and put the plastic packers between the tongue and the wall to get the right gap for expansion/contraction. You'll see that the tongue is proud of the top surface by 2mm so make sure the skirting or beading you're using around the edge of the room more than covers the overall gap of 12mm. If it doesn't, shave off the tongue which will then leave just the 10mm gap formed by the plastic packers. Place the board tight up against the right-hand wall and insert a 10mm plastic packer so you get the correct expansion/contraction gap. You'll have a 2mm tongue there but do NOT cut it off because after you've cut the board to size, you're going to turn it round and you'll need the tongue to locate into the groove of the previous board. However, you must still allow for the 10mm gap so sit the packers on top of the tongue and you'll get the right gap. 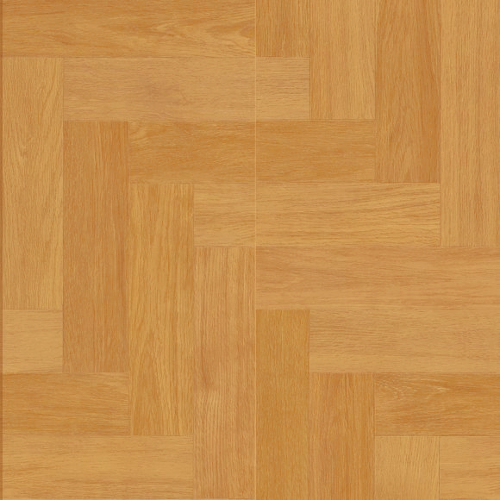 Where you're laying the Herringbone Natural floor, the Parquet Stone floor or any of the tile floors, remember to match up the elements on the adjoining rows to get the patterns to align correctly. 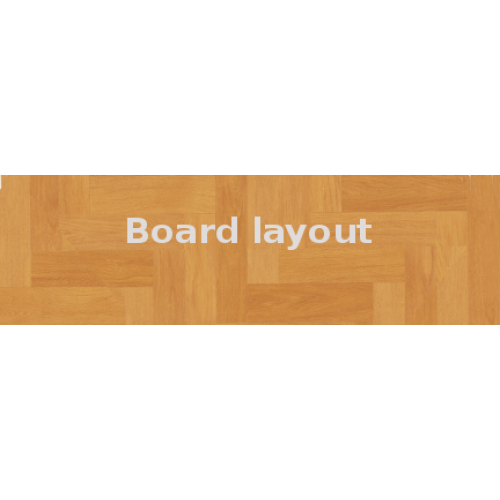 Where you're laying one of the chevron floors, you must lay the 'A' and 'B' boards in alternate rows - i.e. the 'A' boards in rows 1, 3, 5, 7 etc and the 'B' boards in rows 2, 4, 6, 8 etc - again matching up the chevron elements as you go. The offcut of row 1 should therefore be used to start row 3, the offcut of row 2 to start row 4, and so on. The last row can be a bit fiddly to fit and this is where the pull-bar is really useful so use it on the side and the header joints wherever necessary. If you have any trouble getting the boards in the last row in place, shave the lip off the front edge of the groove with a wood chisel and glue the joints together using a PVA adhesive. 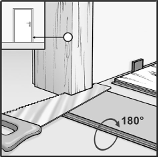 Before you start laying the floor, or at the very latest before you get too close to a doorway, get an offcut of the floor and the underlay, put them up against the door jamb and then use a handsaw to undercut any architraves and door linings as shown in the diagram below. 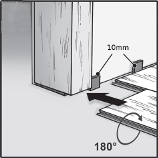 Clear out any debris so the floor can move freely under the door frame once it's installed. Also check to make sure the floor with the underlay underneath can move freely under the door itself and if necessary undercut the door as well. Cut the boards to shape when you reach the doorway, not forgetting the 10mm expansion/contraction gap, so they fit under the door jamb. 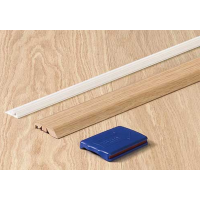 You may find it difficult to click the boards in place around a doorway so chisel off the leading edge of the groove and use a PVA adhesive to glue the boards together wherever necessary. 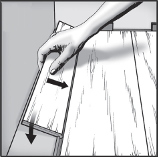 Use the pull-bar and knocking block to pull the boards tight to each other. 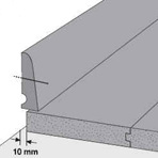 Use a threshold section such as our Incizo profile shown in Related products below, wherever the floor butts up to a different floor covering and don't forget to allow for the 10mm expansion/contraction gap. Your Faus floor is really easy to look after! A bit of care and it will look good for years to come! 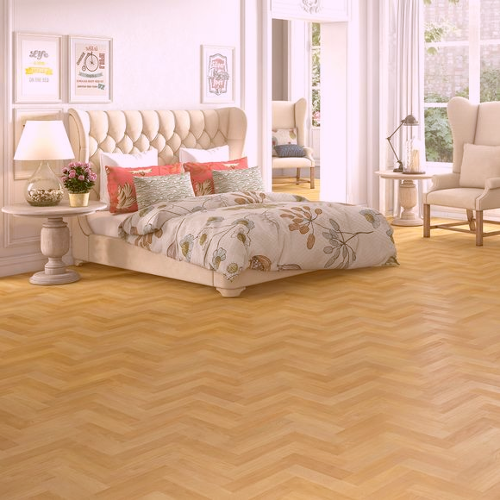 The toughness and resilience of your floor will keep it looking great for years to come. Wear and tear from everyday use is rarely seen. Surface dirt can be removed with a cloth or a vacuum cleaner and scuff marks and difficult stains can easily be got rid of with a slightly damp cloth. Faus floors are light-resistant to level 4 on the Gray Scale according to EN 20105-A02 meaning that the colour of your floor will always stay the same. Use felt pads under furniture legs to stop any unforeseen scratching and put castor cups under the castors on chairs and sofas. Please note that you can void your warranty if you do not use felt pads and damage results. Office chairs with wheels should use Class W soft rubber castors in accordance with DIN 68131. Always lift heavy furniture when you're moving it around the room. Clean your floor regularly. Use a brush or vacuum cleaner to get all the loose dirt off the floor whenever needed. If necessary, use a very slightly damp cloth or mop but don't use too much water and always make sure your floor is wiped dry afterwards. Smear marks can be difficult to get rid of. Small nicks and scratches can be repaired using a colour-matched filler but larger areas may mean that some boards need replacing. 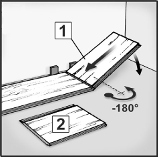 You can do this by taking up the floor as far as the damaged boards; putting in new boards; and then relaying the original undamaged boards. It's also perfectly possible and relatively straightforward to replace a damaged board without having to take up any of the surrounding floor. Give us a ring on 01782 791503 and we'll talk you through it. All goods are guaranteed from the date of delivery for the period and under the conditions warranted by Faus. If any goods are found to be defective during the guarantee period and providing such defects have not occurred through incorrect installation, usage or maintenance procedures, or through the liability of other products or persons, we will at our discretion either rectify or replace the defective part of the goods or refund a corresponding proportion of the original price in accordance with the manufacturer's warranty. All goods should be carefully checked for any visible defects both before and during installation. Any goods which are installed in spite of such defects are not covered by the guarantee. Under no circumstances shall we be liable for any consequential loss whatsoever in the event of any claim arising under a guarantee. Provided the pre-requisites stated hereafter are observed, Faus guarantees that the decor layer of their floors will not wear off within the abrasion warranty period shown for each individual floor, the warranty period beginning from the date of purchase. * The current value is the original purchase price reduced for each 12 month period which has elapsed since the purchase of the floor, the reduction calculated on a straight line basis so as to reduce the original purchase price to zero over the period of the warranty. Any warranty claim which is accepted does not prolong the warranty period of the original floor. Misuse - No responsibility will be accepted for any damage caused directly or indirectly through misuse, abuse, accident or use that is not consistent with the Faus installation instructions. No guarantee either express or implied is given for any damage due to inadequate care or other causes including without limitation, extreme heat or from moisture caused by wet mopping, spills or standing water. Alterations or repairs - Alterations and unauthorised repairs to any Faus flooring will void any and all express or implied warranties including merchantability or fitness for purpose. Reinstallation - In the event that we replace defective boards, we shall not be liable to provide for or incur the costs of removing or reinstalling the defective floor. No liability to replace or repair shall extend to any sub-floor materials or any other items used in the course of removal, installation or refinishing. Except as stated herein no other warranty, express or implied, is provided including any warranty of fitness for a particular purpose. No retailer, installer, dealer, distributor, agent or employee has authority to increase the scope or alter the terms or the coverage of this warranty. No agreement to repair or replace shall in any event act to extend the period of coverage of any warranty provided. In no event shall we be liable for any claim loss or damage arising from the purchase, use or the inability to use its products or from any form of special, indirect, incidental, or consequential damages including, without limitation, lost profits, emotional, multiple, punitive or exemplary damages, or legal fees. In no event shall we be liable for the costs of old or new materials other than Faus floors. In no event shall our liability exceed the amount we actually received for the sale of the defective materials concerned. All claims must be in writing and in order to make a claim under this warranty, evidence of the purchase date and the identity of the original purchaser and installation location must be provided. Without such proof, no warranty shall apply. A classic oak laminated floor but this time in a herringbone parquet format, designed to make a room look that little bit more different. Sheer class! 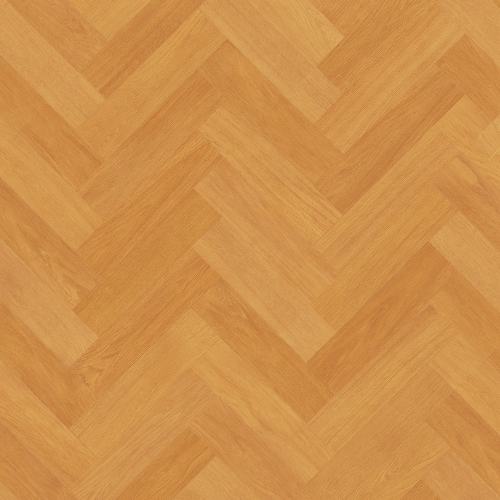 Combining the aesthetic look of oak herringbone flooring with the practical benefits of laminate, this floor is produced using the finest quality materials and to the most exacting technical specifications. The result is an original, exclusive and decorative modern-day floor designed to cope with the rigours of everyday life. Extremely hard-wearing and resistant to everyday knocks and spills, this floor is so easy to care for and even easier to live with. Cleverly engineered to provide strength and stability with its high-density fibreboard core and laid as a floating floor with no need for any bonding to your sub-floor, its profiled edges enable anyone to lay this floor absolutely perfectly every single time, just like a professional would! 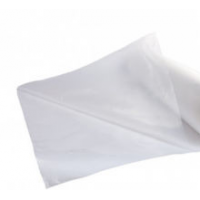 PRICE PER PACK IS JUST £54.84 INCLUDING VAT! A matching scotia beading for the perfect finish around your floor, available for most laminate floo.. 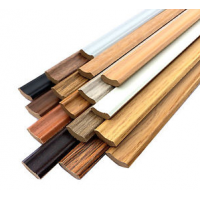 The amazing 5-in-1 Incizo profile for door threshold, trims and stair nosings - ideal for most lamin..
All you need for a smart entrance to your home and to keep your new floor free from dirt and grit!An..